The Martin Luther monument in Dresden, Germany. Martin Luther (1483-1546), a former Augustinian monk and theology professor, began the Protestant Reformation. 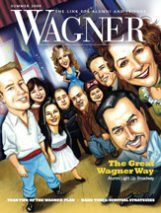 Wagner has been a non-sectarian college for decades. But, like many American colleges, it was founded with a religious purpose — in Wagner’s case, it was founded by Lutheran pastors to educate future Lutheran pastors. 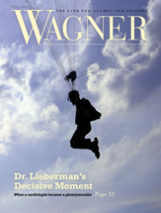 Although it soon embraced a larger educational purpose, for 76 of the College’s 134 years of existence, “Lutheran” was part of its name (Wagner Memorial Lutheran College until 1952, Wagner Lutheran College until 1959). Scores of alumni are Lutheran pastors and Lutheran church members. That history, plus the overwhelming historical importance of Martin Luther and the Protestant Reformation, impelled Wagner’s faculty to offer a full-day symposium this fall, entitled Reflecting on the Reformation: A Symposium on Martin Luther’s 500-Year Legacy. The symposium organizers were Alison Smith, professor of history; Rita Reynolds, associate professor and chair of the history department; and Kristen Whitaker, department secretary. In October 1517, a German monk named Martin Luther nailed his 95 theses, outlining his arguments against certain practices of the Roman Catholic Church, to the door of a church in Wittenberg, Germany. So the story goes, at least. Introducing the symposium, Provost Lily McNair pointed out that the exact details are uncertain. “Last night, we had a very interesting conversation about whether or not Martin Luther actually nailed his 95 theses on the Wittenberg church door,” McNair said. “There is abundant evidence, both for and against. What is certain is that on October 31, 1517, Martin Luther mailed the 95 theses to the archbishop of Mainz.” Thus, he unleashed a series of events that led to what we know as the Protestant Reformation. In addition to the October 23 symposium, McNair reminded the packed house in Foundation Hall’s Manzulli Boardroom of two additional commemorations of the 500th anniversary of the Reformation at Wagner College: an exhibition in the Horrmann Library’s Spotlight Gallery, and an October 31 program by the Wagner College Choir, led by Choir Director Roger Wesby, on “The Music of the Reformation,” in the Campus Hall Performance Center. The Rev. Robert A. Rimbo, a Wagner trustee and bishop of the Metropolitan New York Synod of the Evangelical Lutheran Church in America, also helped to introduce the symposium and the two guest scholars who spoke in the afternoon’s plenary session: Joy Schroeder, Bergener Chair of Theology and Religion at Capital University and Trinity Lutheran Seminary in Columbus, Ohio; and Anthony Bateza, assistant professor of religion at St. Olaf College in Northfield, Minnesota. “Anthony could talk about the political aspects of Martin Luther’s work, and Joy could talk about the oft-ignored role of women in the Reformation … and both could talk about the reformation that is still needed,” Rimbo said. Most of the speakers during the day-long event were Wagner faculty: six professors representing the departments of history, English, religion, and art history. In addition, Wagner’s chaplain, the Rev. Martin Malzahn, and a visiting Fulbright Professor, Kamil Wielecki, added to the conversation. Read on for quotes and observations from the many interesting presentations given that day. Steven Thomas, associate professor of English, noted that Luther’s insistence on translating the Bible into vernacular, and distributing it in print, touched off a cultural revolution that spread to all parts of the world. He talked about vernacular translations of the Bible into the Massachusett language in North America and the Oromo language in Ethiopia. 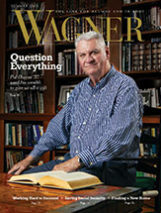 Walter Kaelber, Robinson Family Chair of Comparative Religion, argued that the “Two Simple Words That Changed the Christian World Forever” were not sola fide (“by faith alone”) but two German words: vollbringen (“to accomplish” or “to pay in full”) and Beruf (“profession” or “vocation”). The former refers to Luther’s German translation of Jesus’ saying in John 19:30, “Es ist vollbracht” (“It is finished”), and the latter to Luther’s teaching that all work, no matter how humble, should be viewed as a divine calling. Laura Morowitz, professor of art history, showed how Protestant ethics can be seen in 17th-century Netherlandish art. Lori Weintrob, professor of history and director of the Wagner Holocaust Center, spoke of Luther’s anti-Semitic writings, the German Lutheran church during the Nazi era, and the continuing legacy of anti-Jewish art that is part of churches in Germany and France. Rita Reynolds, professor and chair of the history department, looked into the Puritans’ doctrine of predestination and their view of Native Americans and Black slaves. At the symposium’s end, the two guest scholars and Bishop Rimbo were asked to summarize the best and the worst of the Lutheran heritage in today’s Lutheran world. Joy Schroeder, whose talk had pointed out that the Reformation did not have great results for women’s rights and opportunities, spoke of the positive Lutheran heritage of valuing vocation and the holiness of everyday life. Anthony Bateza praised the Lutheran tradition of direct, hands-on service to others, and highlighted its failure to address larger systemic problems such as racism and heterosexism.